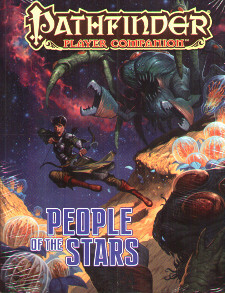 Travel to other planets and harness the powers of the stars with Pathfinder Player Companion:People of the Stars! Whether you want to play a Golarion native daring the depths of outer space or an alien being exploring your own mysterious homeworld, you can unlock the secrets of the stars with new rules, advice and fantastic setting details in this volume. Rules for how to play four of the Pathfinder campaign setting's most iconic alien races: nanite-infused androids, four-armed kasathas, telepathic lashunta, and seasonally morphic Triaxians - including complementary new archetypes and feats. Details on each of the most important celestial bodies in the Pathfinder campaign setting, complete with tips and rules options for amateur and experienced star-travellers alike. This Pathfinder Player Companion is intended for use with the Pathfinder Roleplaying Game and the Pathfinder campaign setting, but can easily be incorporated into any fantasy setting.